← What do You do with the Gift of Time? If God is loving and all powerful, why does he allow evil? Where is God when bad things happen to good people? For many people, suffering, especially that of innocents, is grounds for doubting the love, power or even the existence of God. I’ve read books that make my head spin on this subject, but in the end my conclusions are much simpler. 1. What should God do about evil? Really. What should he do? Maybe you think, “Well, he’s God, so why doesn’t he just wipe out evil? Supernaturally stop it. Take out all the bad guys.” Ok, what happens when we take that to its logical end? Who are the bad guys, exactly? How bad does one have to be for God to take him or her out? I hate to break it to you, but if God really wiped out all evil on the planet we’d all be gone. End of story. 2. Does any world view, besides Christianity, offer an acceptable solution to the problem of evil? The secular worldview treats this short life on earth as the whole story. Suffering, therefore, is to be avoided at all costs. So we have laws upon laws geared to assigning blame, avoiding risk and preventing suffering. It’s not working. Islam recognizes an afterlife, but its followers don’t know if they will enter heaven or not. Allah will weigh their good deeds and bad deeds against each other to decide whether one will enter paradise. Hinduism teaches that our souls are eternal and that they are reincarnated multiple times upon the earth. Each time the soul has an opportunity to improve. Buddhism treats suffering as an illusion and detachment will overcome it. When one becomes enlightened enough, he or she won’t be bothered by suffering any more. I believe that Christianity, when compared with other world views, philosophies and religions, offers a superior perspective on suffering. 3. 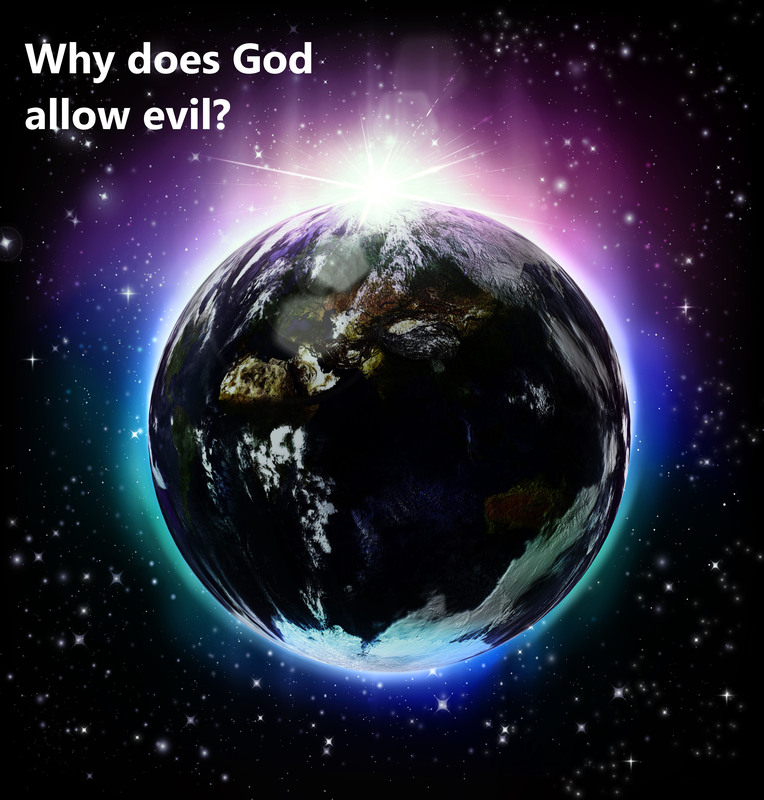 What is God doing about evil? The world is full of evil, and it is difficult to make sense of that in conjunction with belief in an all powerful and good God. However, Christianity offers one game changing truth. Jesus, God incarnate, entered this world to live in the midst of evil. God himself knows what it’s like to live among selfish, unkind, and violent people. He experienced it; he surrendered to it. Why then is evil so prevalent? Jesus inaugurated the Kingdom of God, but he didn’t do away with the kingdoms of this world. Therefore, we are now living in the tension between the two. Most of the time we experience God’s Kingdom in righteous power and goodness; sometimes the kingdoms of the earth dump on us with pain and evil. Christians also know that Jesus will return, and he will make everything right. It requires faith. It’s not easy, but that’s the best I can do. What do you think about the problem of evil? Gallery | This entry was posted in Christian Life, Christian Witness, Death, Faith, Jesus, Life, Power of God and tagged Christian view of evil, Christianity, Evil, God Incarnate, Jesus, The Problem of Evil, World views on evil. Bookmark the permalink. Good and evil are the two sides of a coin. Evil and good are both interrelated. Is there is no evil then what will be the importance of good? All kinds of books have been written, but it really comes down to God honoring His word (Psalm 138:2). His word was set in place before the foundations of the world were created. So, when Adam and Eve sinned, God had to step aside and allow Satan to be the god of this world. Thus, evil exists in the world. Like you said about evil: “And he defeated it.” We can live in that victory by faith for now. And because God knows everything, he is omniscient, he knew Adam and Eve would sin and that he would allow evil into the world. It’s a little mind-bending to think about. You are absolutely right that we can live in Jesus’s victory by faith – and more faith – for now. Faith is the key, for without it nothing makes sense.